The songbirds and I are in agreement: Winter, such as it wasn’t, is over. 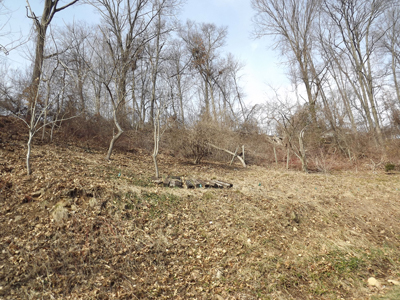 Time to make way for Spring, and for me that means hanging out the real estate. 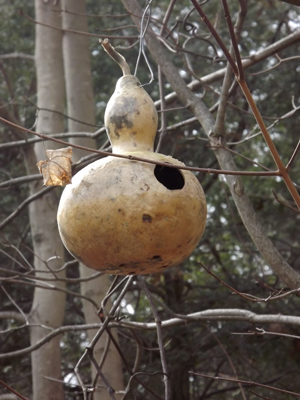 In the autumn of 2010 I made bird houses out of the decorative gourds I’d grown in the garden. 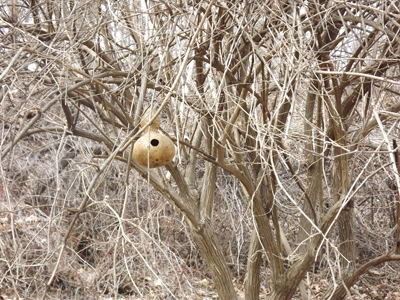 I put the bird houses into service in the spring of 2011 with limited success. Half of them were attractive enough to sparrows, chickadees, and wrens to have nesting material in them. But, full disclosure, I don’t think any of them were used to completion. I never saw mother birds flying back and forth with food for nestlings. I think part of the problem was that I hung the bird houses too late in the season. I think the industrious mothers were disheartened by my tardiness, and nested elsewhere. 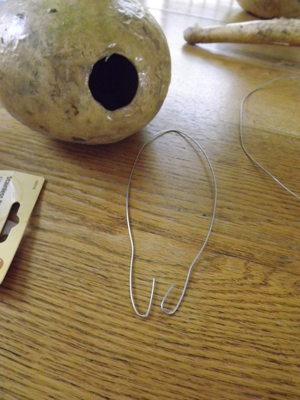 I also think I hung the bird houses too low and in too-conspicuous locations. 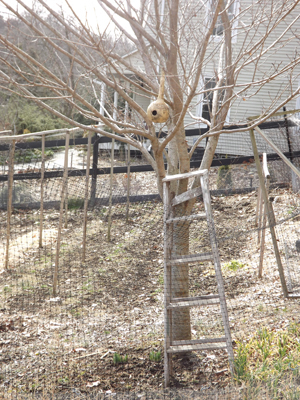 I guess the mother birds were a lot like my Husband — they wanted privacy and elevation. 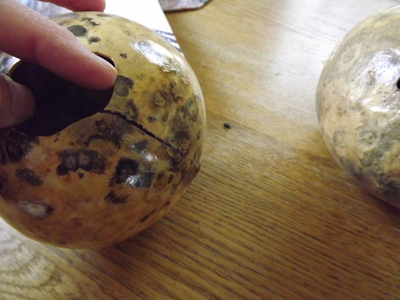 The smallest gourd, and also one with the thinnest wall, had a crack. Husband walked through the room as I muttered, “Dang!” He suggested that all was not lost. 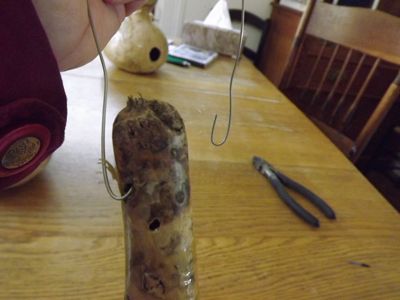 He pointed out that I had drilled holes in the bottom of each gourd for drainage, and so what was another crack? Think of it as ventilation. I agreed, but thought I would hang this compromised, sub-standard housing in the most sheltered area. You will see in a moment where I placed it. 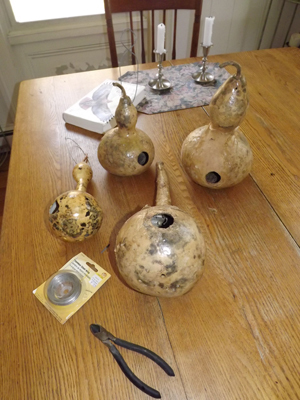 The gourd bird houses were now ready to be placed. 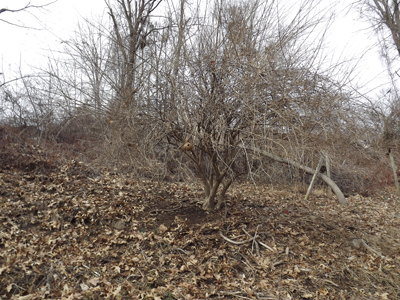 There is a Beauty Bush up the hill that is a favorite gathering spot for songbirds. They rest there when visiting my bird feeders below. In the winter I can barely see the birds because their brown and gray feathers blend so well with the leafless branches. 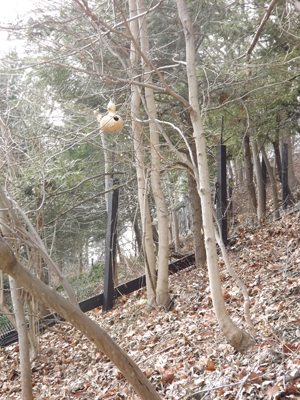 In the summer I can barely see the birds because the leafy branches provide perfect cover. I hope that expectant mother birds find the proximity to food (for them) and the dense cover (for the babies) to be attractive. As I looked about to find the next likely spot to hang a bird house, I was distracted by the moxie of a white-throated sparrow at the base of our bird feeder. Copious amounts of millet had spilled, plenty for the tubby mourning doves, elegant slate-colored juncoes, and the one sparrow. But he wasn’t having any of this Kumbayah Sharing nonsense. Spring is about Love and Love often means Crabby Behavior (ask any teenager), and so this tiny bit of alpha went after the other birds and cleared the area. I was impressed. 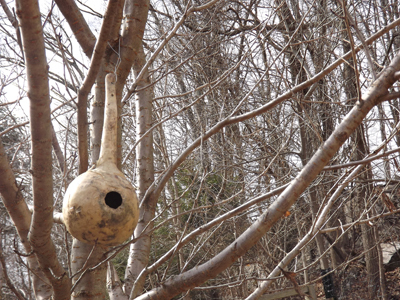 I hope he finds one of my bird houses worthy. I bet he’s the one to start a Neighborhood Watch. 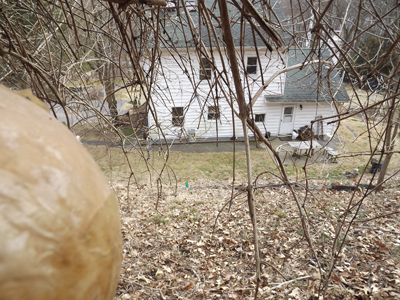 The third bird house was placed above what will become my Squash Garden of 2012. Zephyr summer squash and kabocha winter squash below, and….chickadees above? And the view from afar, so you can appreciate how high I had to reach! Best of luck on attracting new residents! Thank you, Sue! Lovely to hear from you again — sorry for my long absence. I will indeed report on any birds that move in! Very cool and good for you for hanging these houses everywhere. 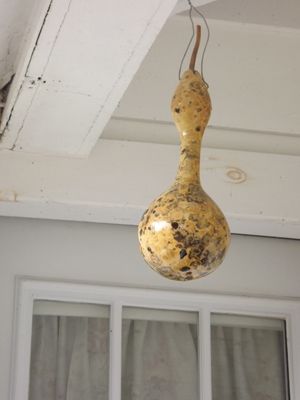 I’m thinking about growing gourds this year. Give those vines lots of real estate. They’re very enthusiastic! Well, if I were a bird, I know where I’d wanna live! Thank you, Kevin. I’ll put your endorsement on the listings for the gourds!